At the end of January, many of us drift away from our resolutions and fall back into our mundane routines. Was self-improvement involved in your resolution? If you’re like me, you’re wondering how you can get better at your job and become more influential in the new year. To become a more influential and effective information technology professional, start not by examining your technical chops, but instead evaluating your soft skills. Do you play well with others? Do you inspire dedication and creativity from your peers? Do you motivate your team for the highest levels of performance? On-the-job ability is crucial to success, but IT professionals who match their technical skills with effective soft skills are more successful. In business, one’s abilities are only a small part of the equation. In order to be well-known and successful in your field, you must also have the skills to inspire confidence and clearly communicate your value. How can you continue to grow and enhance your effectiveness in the workplace? 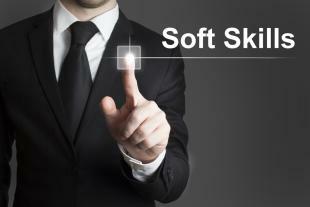 You need three critical soft skills: communication, leadership and time management. How do you get started? 1) Communication: Whether you’re typing, texting or tweeting, communication enables you to understand colleagues, partners and customers and achieve agreement on tough questions. Communication falls into four basic types: person-to-person, person-to-group, group-to-person and group-to-group. The clarity of your messages and your persuasion skills influence the way you and your work are perceived. Written communication skills are crucial for IT workers. Being able to describe complex problems and concepts is difficult. What seems relatively simple to you may baffle your client or your boss, so you need to be ready to present your thoughts with structure and clarity. Verbal communication can be equally difficult. While face to face communication allows for added conversational fluency, one runs the risk of being off-putting or miscommunicating an important message without realizing it. Many IT professionals are also introverts, making a conversation with a coworker or superior even more harrowing. Leaders oversee other employees and manage their work. Leaders understand the purpose of tasks and how to communicate innovative and existing ideas. Leaders know how to multitask and distribute work amongst employees. Leaders also generate and execute new ideas in order to enhance productivity and meet objectives. Some individuals are naturally better at bringing teams together, but anyone can develop the skills to become a great leader. 3) Time Management: “We’re behind… we need one more day!” Exclamations like that are the result of poor time management. Not to worry, there are ways to become more efficient. IT professionals need to know how to prioritize their work in order to meet deadlines and maintain a positive work environment. Priorities vary from project to project, but every worker should implement deadlines in order for each task to be accomplished. When time frames are in place, IT professionals better know how to distribute their work to finish on-time. Goals are critical for everybody and are only met when projects are completed. Forget about procrastinating, immediately enhance time management by erasing the words “wait” and “late” from your vocabulary. Communication, leadership and time management are essential in any work environment. To enhance these skills, ask your supervisor for one-on-one training, or you can take advantage of the plethora of training resources provided on the internet. Soft-skills are the foundation for any job, so make sure you do your job by communicating, leading, and finishing work on time. Have an anecdote of a time you wish you had a skill that you were lacking? Please share with us in the comments below.